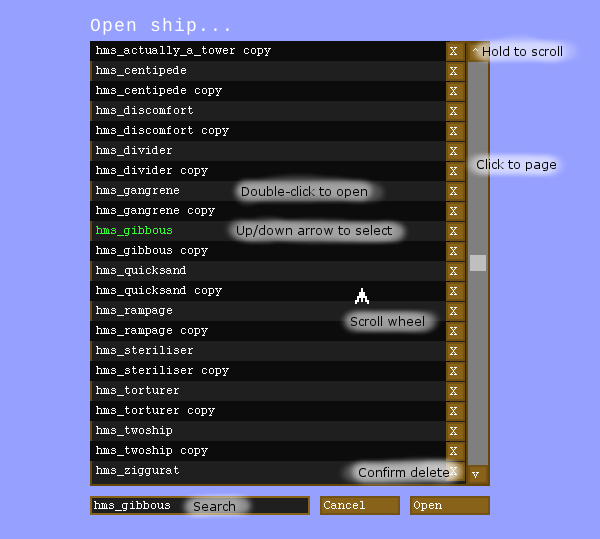 An update on file dialogs - and a request for ship name ideas. The next big thing in Airships is going to be multiplayer: two-player realtime brawls of airship fleets. But before that, I needed to do a bunch of polish: most importantly, a load/save dialog for airships. This is unexciting but necessary: you need an UI for adding ships to your fleet during multiplayer setup. Up to this point, I had been using native file dialogs, but these work badly with fullscreen, so it was time to write my own. But there's so many little interactions a file dialog has to do. For example, there's at least four ways to scroll: up/down buttons, paging by clicking on the scrollbar, the scroll wheel, and arrow keys. Half-assed file dialogs are a bit of a pet peeve for me in games (such as Civ V's sorting always reverting to alphabetical instead of by modification date), so I tried to do a good job here - and I think I got it pretty much right, though I'll want to do a bunch of UX testing. Next, I spun out the input field code to finally let the user rename their ships. And speaking of names, I'm looking for suggestions for more default ship names. I've got a reasonable list, but more is always better. The kind of names I'm looking for are ones that would be made up by a bunch of smart but rather unbalanced people, like Tentacle, Uninvited, Omen, Centipede, or Steriliser. No heroic names like Victory or Lion. This is the list so far, after a fair amount of brainstorming - please comment with suggestions, and I'll add any that fit. Redeemer. Nebuchadnezzar. Celerity. Dementation. Metuselah. Antediluvian. Event Horizon. Apocolyptica. Recursor. Recurse Indefinitely. Infinite Recursion. Recursion Recurrance (warming to a theme here, I'll jump ships!). Nimbostratus. Grandfather Paradox. Harbinger. Rigor Mortis. Downward Spiral. Reductionist Agenda. Conspiracy Theory. Nebula. Wayward Principles. Malfunctioning Philosopher. Golem.